I don’t tell a lot of tales of A here on the blog because I respect the fact that he is in his 20’s and may not enjoy me sharing his life story anymore. For those of you who don’t know, A is my Stepson. I have known him for almost 18 years as a StepMom, but truly have known him since he was born since I have known his Dad since we were kids ourselves back in High School (yeah that would be… umm.. 29 years!!!) and to be completely honest I have known his Mom just as long. Hubby and I did not start dating until almost 18 years ago, but since our best friends were brothers we saw each other a lot throughout the years one could say it was inevitable. And before any of you cast stones, no I did not break up Hubby and A’s Mom, they were long over/never really together so yeah, put down the rocks. For anyone who isn’t a StepMom or StepDad you may not understand what it is like to love someone and feel like they are part of your family, but then have to say goodbye for a week or two and really, never know when you will get to see them again. For many years our time together was every other weekend, one night a week for dinner and a few holiday long weekends. We packed as much as we could into those little bits of time and then had our hearts broken when we sent him home. Sure Hubby could have fought more and demanded more time, but in his heart he did not want his child to go through what would have been an ugly time in court, but rather sacrificed his time together so that the time we did have together was nice instead of strained. In the end I think it has all paid off. A has grown into such an amazing man (and that almost kills me to say man, but truly that is what he is). He lived with us for about 9 months last year, which we savored every moment we had with him. We kept J and Apple quiet so he could sleep. I may have seen him the most as he slept late and got up to head off to work during the day while I was home. He would spend time with the kids on his days off and often helped me out by picking them up at school if I had a shoot. He even surprised me with dinner a few times, which was amazing given that he is a fabulous cook in a great Italian restaurant. Then last Spring he moved out on his own, got himself an apartment has a couple of roommates and loves being Mr. Independent. Last week he texted out of the blue and says he wants to bring his girlfriend over for dinner. Of course the answer is YES!! But, he has never brought a girlfriend over because we tend to embarrass people we love, unintentionally of course, but it happens. And I go into full out Party Planning mode, something I haven’t done in a while and only realize I am doing it halfway through. I clean and tidy and scrub. I prepare an elaborate dinner, after checking for any dislikes or allergies. I pick up Apple and J from school, and this is when I realize that I am not the only one nervous. For some reason I feel like I have to extra hard for A, not because he doesn’t show me any love because he does, but because I want to make sure he is always happy to come over. When I pick up the kids, J says to me, “I wish school wasn’t over yet, I am not ready to go home”. I look at him, feel his forehead and wonder what has gotten into my child. I ask him why to which he replies, “I am so worried I will embarrass my brother tonight that I don’t want it to be time yet”. WOW. I guess my little, “Can you guys behave tonight?” at breakfast sat with him all day and he took it to heart. He cleaned up a little more of his games and room, just in case she wanted to see, and washed up and talked nice to his sister and waited, with baited breath for their arrival. Apple on the other hand was bouncing from pillar to post asking every five minutes when they would be arriving. I sent them off to the basement so I could finish dinner and wait for our guests to arrive. And they did, she is lovely, and he was excited to introduce her. Apple and J behaved, talked the least through a dinner since they were babies. We chatted, asked questions, and then they were off to the basement to check out some of the stuff A left here when he moved out. They didn’t stay too long, just long enough. Hubby drove them home and I later sent a text thanking them for coming. And so my life as a StepMom continues as we go into a new era of girlfriends and visits that are further apart. I hope we did alright, but only time will tell if he brings her (or other future girlfriends) over again. And then we I look at the grand scheme of everything I have to be reminded that I am not his Mom so I still get very little say in anything. I just have to give my love and hope he returns it. And I have to look at the fact that he is a good man, he is caring and kind and a hard worker and I just have to hope that I had a little hand in that being around him for the last almost 18 years. 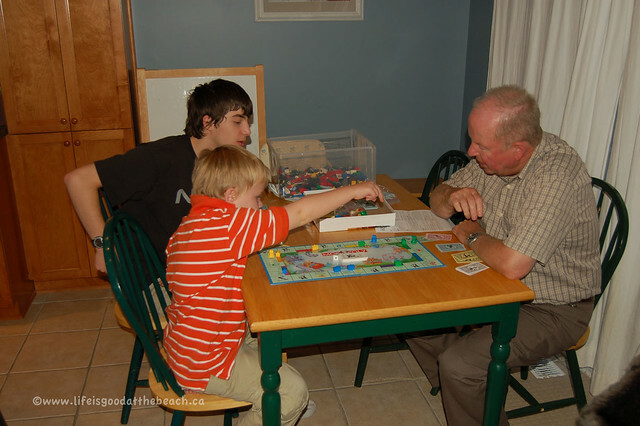 To leave you with one photo, here is an older one of Opa with J and A playing Monopoly.